Back in the 1980s, Kenner produced a fondly-remembered action figure line called Super Powers, which featured DC heroes like Superman, Batman and Wonder Woman, as well as more obscure characters such as New Gods Orion and Darkseid. At the same time, Mattel - home of Barbie and the then-hugely popular Masters of the Universe line - put out a line of Marvel superhero action figures called Secret Wars. Fast-forward 20 years. 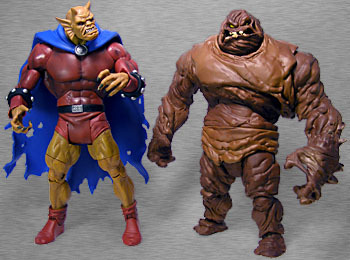 Hasbro (who absorbed Kenner in the 1990s) took over the Marvel license from ToyBiz and resumed production of its long-lived line of 6" figures, Marvel Legends. Mattel, on the other hand, had already gotten the Batman and Superman toy rights, and eventually secured the rights to the entire DC comics pantheon. After some growing pains - their Batman line morphed into the combination Batman/​Superman DC Superheroes line, and now into DC Universe Classics - Mattel hit their stride with their own 6" superhero line. 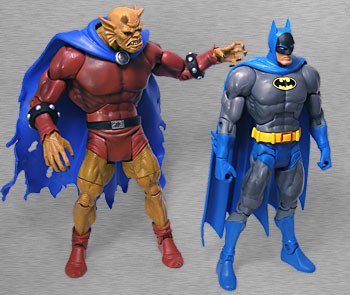 So now the roles have been reversed: Kenner/Hasbro now plasticizes Marvel superheroes for the mass market, while Mattel gives us 6" totems of Superman, Batman, and... Etrigan? Originally summoned from the pits of hell by the wizard Merlin to defend Camelot from the witch, Morgana Le Fey, Etrigan in recent years has become a monster possessed by the soul of his human host Jason Blood. He can transform between his demon and human forms only if a special incantation is read. Although adept at magic and sorcery, the demon Etrigan prefers to blast his opponents to cinders with his fire breath. Since he's a somewhat obscure character in the DC universe, I was a bit surprised when Jason Blood's alter-ego was announced as a member of the very first wave series of DCU Classics. He's one of my favorite DC characters, so I was more than pleased he made the cut. The Four Horsemen made their name sculpting for McFarlane Toys in the 1990s, and their incredible skill is on display here. Mattel's improved tooling and production has allowed for significant improvements in sculpts even from the revamped He-Man line earlier in the decade. Etrigan features a brand new body shape - it's not, as some predicted, a retool of Bizarro or Darkseid. The sculpt emphasizes his large torso in contrast to his relatively small legs for that "football player caricature" look. He's also enormous - when standing straight up, he's taller than Clayface, and has the same heft to him. The Horsemen seem to have gotten Mattel to finally listen to sense on the scale issue - thus we get large figures like this. Etrigan's facial sculpt is excellent, possibly the best of the series. The Horsemen have lovingly captured every crease, tooth, and horn on the Demon's head. His clawed hands are also detailed and posed in a good demonic reach. He's wearing his trademark red unitard with yellow tights (maybe - or is that just his skin?) and red elf shoes. Go ahead, make fun of him. The last guy to do so got a face full of belched hellfire, so mock at your own risk. Overall, the sculpt is more detailed than the 1999 DC Direct figure, though that figure did capture Kirby's original art a bit better. However, that's to be expected, as the Classics are intended to be the Horsemen's own interpretation of these characters, allowing for consistency across the line. The cape is made from rubbery plastic. Other than some rips at the bottom, it's fairly plain; some rough texture would have been nice, but that may not have cost out. Still, it's an improvement over the DC Direct figure's softgoods. If there is any problem with the sculpt, it's that the swivel joints around the thighs don't quite match up - as if the lower part of the leg came out of the mold a bit too small. It's a credit to Mattel that Etrigan's paint applications are so good, the plastic used for most of the mold isn't obvious. The only obvious plastic is the rubbery cape, which is a bit brighter and plainer than we might have liked. The paint applications are superb for a mass market line. After much trial and error, Mattel finally seems to have figured out how to put a nice wash on a mass market toy, and it shines on this line. All the demonic details on Etrigan's craggy face, hands and legs are brought out by the wash, which also adds just the right shadows to his unitard. The only place where the paint disappoints is on the metal bolts of his bracelets; after seeing what companies like Mezco can do with metallic textures, flat silver paint just won't cut it anymore. I think the Four Horsemen have found the sweet spot for articulation. 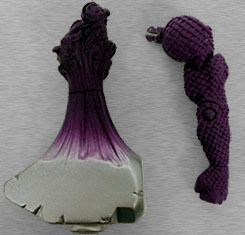 The most important joints on an action figure are the balljointed neck, balljointed shoulders, and the ability to move the leg outward to the left and right as well as forward and back. The DCU Classics have all those joints, and what's more, the clever hinge-post joint at the hips allows for a natural range of motion while minimizing the effect on the sculpt. The absence of double-hinges at the elbows preserves the figure's look of strength and solidity, while the combination hinge/swivels at the ankles are just icing on the cake. 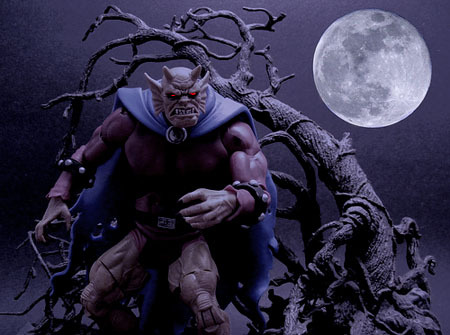 The torso joint, considered a luxury by many toy companies, is important for a character like Etrigan, a demon who is usually hunched over. The Build-A-Figure concept has taken off in the action figure industry, and Mattel climbs on board the bandwagon with this line, featuring "Rex Mason, the Element Man" - a.k.a. Metamorpho. 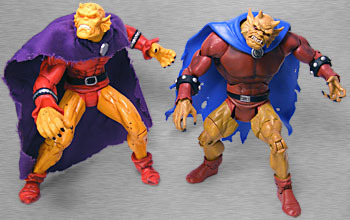 Etrigan comes with his scaly, purple, left arm. His coolness as a figure is factored into this one's as an accessory. 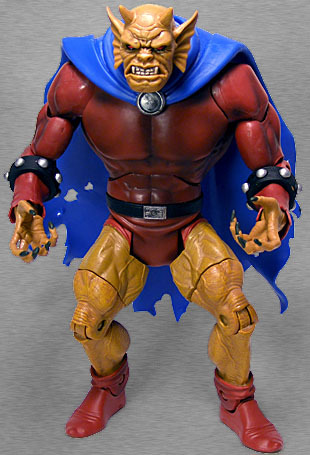 Other than that, Etrigan comes with no accessories; however, he's not really an "accessories" kind of character, anyway. Since the inaugural DCUC series also features Orion, you have to wonder if this isn't part of a conscious effort by DC to highlight the work Jack Kirby did for them. Etrigan was one of the few characters (other than the New Gods) that Kirby created during his relatively brief time at DC Comics in the '70s. Between these figures and the heavy emphasis on the New Gods in DC's Countdown and Death of the New Gods, DC seems to be paying tribute to the comics legend whose name is usually associated with Marvel Comics.